With two theme parks to choose from and little time... Which do you visit? Both Madrid theme parks have their respective merits but, as always, its the kids who will make the choice! Here you can get a good idea about each so as to try and influence their thought process...good luck! The newest and largest of Madrids theme parks it is 20kms to the south of the city resting on 250 hectares next to San Martin de la Vega. Styled on Disneyland or Universal studios this is the theme park of Bugs Bunny & company! Hollywood Boulevard - California style buildings and rides... You will think you are in Los Angeles! Cartoon Village - All the famous characters from Warner Bros long cartoon history.. "Was up Doc?" Old West Territory - The typical frontier town of the old wild west jazzed up with roller coasters! 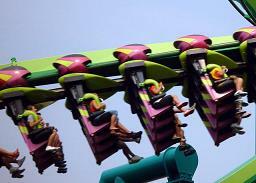 Superhero World - Fly with Superman or experience a loooong drop! Warner Brothers - Watch how films and cartoons are made... guided by the stars! Opening times:Changes according to day of the week and Month. Open from April to September inclusive. Almost downtown, located by the side of Casa de Campo this theme park can be reached either by Metro: Batan or numerous bus routes. Whilst a taxi is no more than 10€. Although the older of the two Madrid theme parks this has allowed the trees to grow so providing shade during those hot summer months. With over forty rides or shows almost on top of each other there will be no sore legs from pushing a pram. With everything from large drops to infant sections there is something for all ages. Of course you could just spend all day going around the three water rides to keep cool! Residents Tip: There are tourist family cards available that combine the park of attractions with the Madrid Zoo & Aquarium as well as the Teleferico cable car. So perhaps theme parks are not your style... try here for alternatives to Madrid theme parks!